The Hunter came about in a rainy summer day in The Hague, Netherlands. I was living in a hotel room in the capital, working on a project, watching 100s of people riding their bikes every day. There were Holland bikes, road bikes, some mountain bikes and loads of city bikes. The project was set in a facility that closed every day at 17:45 and daylight extended until 22:00 or so. That meant that I could, potentially, spend 4 nights a week riding and exploring the Netherlands. That was only possible with a bike that was fun to ride and could be easily transported back and forth between Berlin and The Hague. That bike did not exist. The obvious solution was Ritchey’s Breakaway. As I started trolling the various forums for a second hand breakaway, I spotted a post about an unfinished, custom made, Rick Hunter travel bike. The post described a project that started two years prior and was about to finish. In those years of waiting for the frame, the seller went through a complete family state change (him and his wife had a baby) and with that dreams of riding across China in an American handmade bike were somehow put on very extended, potentially infinite, hold. Well…I jumped on that post like a tiger on antelope. It certainly helped that the poster was, and still is, a good friend who happened to be the same height as me. And so the adventure with Hunter started. First on the agenda were a few decisions that had to be made: cantis? Disks?, why not both? Eccentric bottom bracket? Why not? Cable routes? Top and bottom please. Racks? Of course. Fenders? Hell yeh. Basically any options that was on the table was answered with a yes. Smart? Probably not, but certainly diverse. The project really took off in a business trip to California where I was finally able to pick up the frame, pack it in it’s Ritchey Breakaway case and take it back to its new home. The frame was beautiful and with 132.5mm drops, both 130mm and 135mm hubs could be used. I christened, or circumcised, or blessed the new build with the appropriate name: Der Panzer. It’s build like it would be the bike to jump on when the apocalypse finally arrive and ride into safety. With 13.25 kg of weight it’s not going to out-ride rabid zombies, but it sure as hell could ride over them. The center piece in the build is a 14-gears, handmade in Germany, Rohloff hub. It’s rumored to be the only viable competition to the energy bunny – it just keep running. There are two problems with Rohloff hubs though. 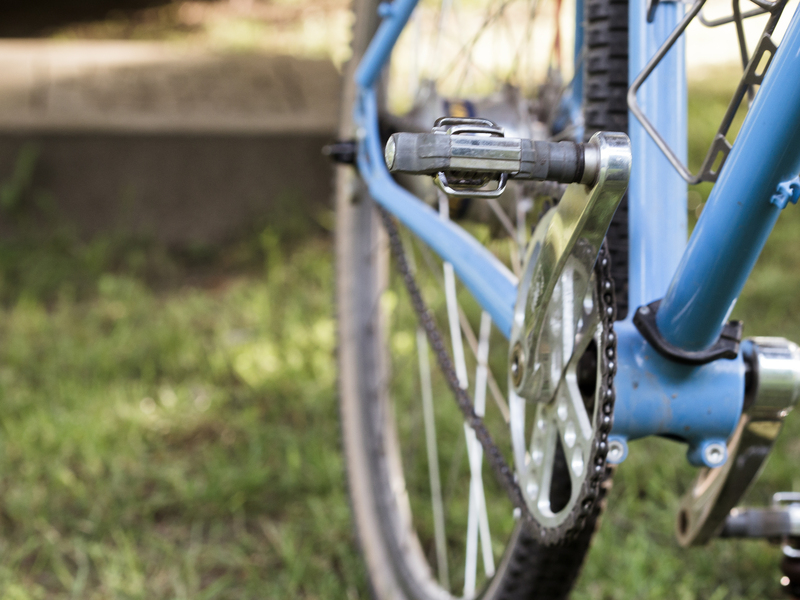 For starters, they are meant to be used with mountain bikes which means that the super-mechanical shifting system is designed for flat bars and not for drop bars. Luckily there is another European solution for this – Mr Gilles Berthoud has constructed a replacement shifters that could be attached, very elegantly, to the drop bar. So problem solved. The second problem is the fact that the hub weights a ton, or rather, 1820 gram. This is not so easy to solve other than in keeping the rest of the components super light. Engineering is the art of finding the best solution within the given budget. You have to learn to make compromises and, as it turns out, the same rule apply to bike building. Even if the rest of the bike was to be made out of space-material-not-yet-known-to-man-lighter-than-anything-we-now-know the weight of the hub will still make the whole bike very unevenly distributed. So keeping the rest light, quickly became a moot point. The only cranks that really came into question were White Industries ENO. Why? Good question. At some point it became pretty clear that the build, other than the wheels which were going to be European (and will be when the Shimano dynamo hub is replaced with a Schmidt Original Nabendynamo), was going to be “Made in America”. So the gleaming silver White Industries cranks just looked damn good and were build to survive that apocalypse. This resulted in a bike with 14 gears and not a single derailer in sight. Oh the joy of minimizing risk. I could wax philosophies about why are there Paul Minimoto brakes on Der Panzer. I could say that this was meant to keep the weight down, but lets face it, it’s not. The real reason was that I wanted to try them. The other reason was the idea that if, through some baggage handler, the breakaway bag is stomped on, the bike will still be usable. Friends all had horror stories about brake rotors getting bent and not being useful anymore. Since I envisioned the bike going through various states of development I was happy to be talked into using some mini-v brakes and see what happens. So far the Paul Minimotos have proven to have immense stopping power. However, there is hardly any more clearance for thicker tires. With the current Bruce Gordon Rock’n’Road there is perhaps no more than 2mm left between the cable and the tire. 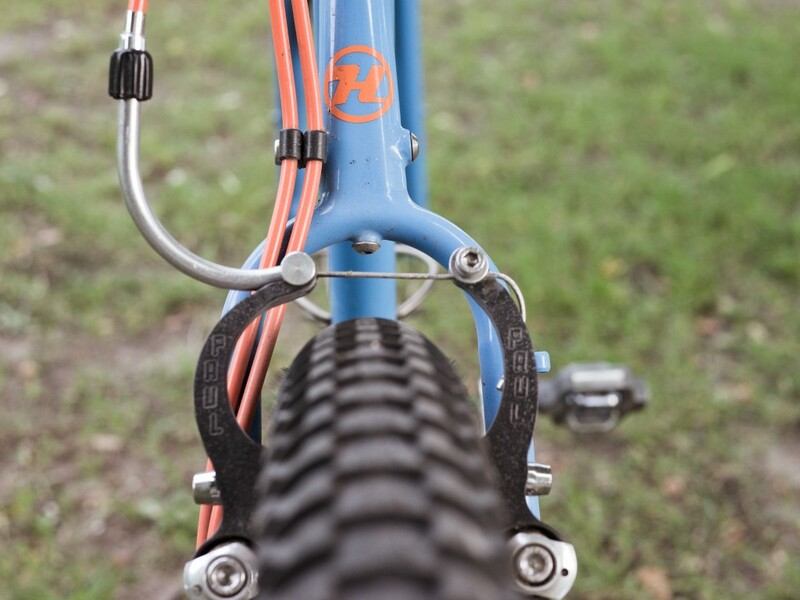 Panaracer Fire Cross are most definitely out of the question with their 622×45 size and bigger, 29er tires are not going to happen with these brakes. When the bike was first conceptualized it was very clearly made with the idea that it will be an aggressive touring bike. So Rick Hunter put his signature fork on her. 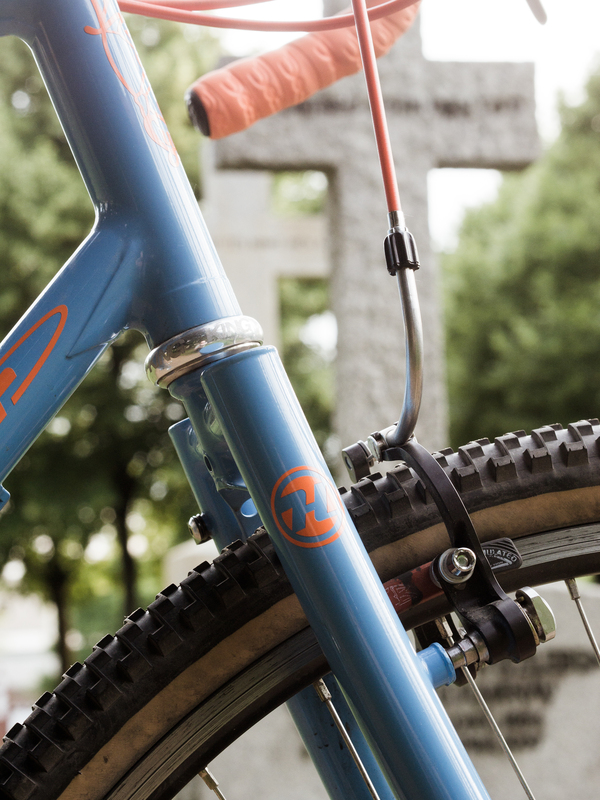 The fork truly ensues confidence that the bike could ride over anything. In the 100s of kilometers that I already put on Der Panzer, I never felt like the fork flexed or was in any kind of danger – it’s a little bit like an elephant’s tusks, you know it’s there and it looks fragile, but it sure as hell not. A ride as diverse as this could not really be complete without an eccentric bottom bracket (EBB). Now Der Panzer is hardly the first bike I own with an EBB, but the EBB on it is my favorite by a mile. As opposed to the Bushnell EBB in my other ride, this one does not require special tools to be adjusted. A simple allen key will unlock the two screws that hold it together and will allow you to set the chain tension. When riding a Rohloff or a single speed setup this is an easy way to get the chain tension just right and in my humble opinion, it also looks pretty damn good. Overall I’m very pleased with the build and with the possibilities that lie ahead of us. Who knows how long will Der Panzer stay at the current configuration? There are a few wheels waiting in the kitchen workshop (a topic for another post) that would work great on it. We have to wait and see until it spend some time traveling and then changes could be made.